Welcome to the Lodge Farm B & B and Stabling website. 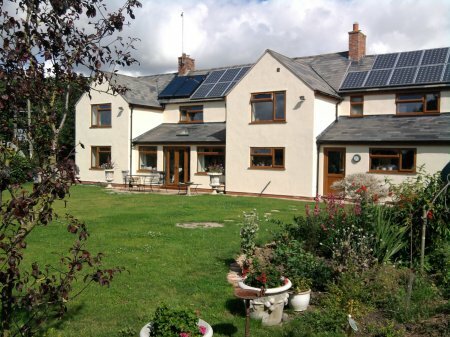 Lodge Farm Bed & Breakfast is a working sheep farm, run by Ted and Val Mawby and offers to its’ guests a home from home experience. The farmhouse is situated in picturesque countryside, surrounded by woodland and pasture land, yet centrally located and easily accessible from all Midland motorway networks. Its’ peaceful location makes it ideal for holiday makers and business people alike. All our bedrooms are south facing and look out onto the garden and open countryside. The nine stables are all within a barn next to the house, they range from 14' x 12' to smaller stables, ideal for ponies. Straw, shavings and rubber matting are all available, as well as good quality hay. Lodge Farm is in the hamlet of Woolscott, situated on the Warwickshire / Northamptonshire border, 5 miles south of Rugby. A footpath runs through the farm from Onley to Grandborough and there is a cycle path alongside the main road. A bus stop at the end of the drive offers a regular service to local towns. We try to reduce our 'carbon footprint' at Lodge Farm and have both solar and photo voltaic panels, We produce our own lamb and eggs, grow vegetables and make our own jam and marmalades. Lodge Farm is a working farm and wherever possible we like our guests to enjoy the surroundings.